Do It Yourself Soil Retention. When it comes to holding back tons of dirt, you basically have two choices. 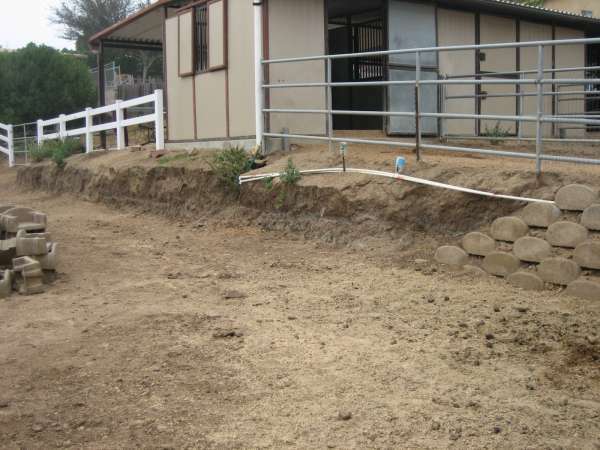 Hire a masonary contractor and have a traditional concrete block wall built for, usually, thousands of dollars. 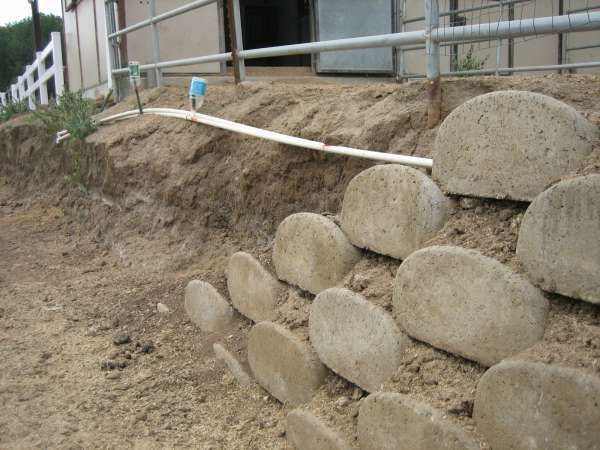 Or, you can do it yourself with interlocking retaining wall blocks like these at soilretention.com. 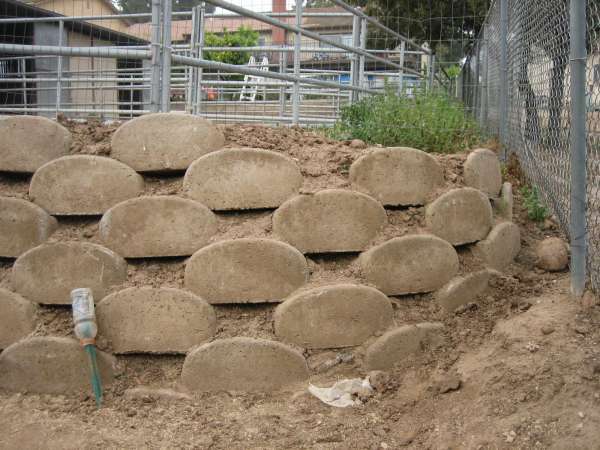 The use of retaining wall blocks as opposed to traditional concrete retaining wall construction is increasing in popularity. You may notice many new commercial construction projects that are using the stacking blocks method of retaining wall construction for many reasons. Building permits are not required until the wall becomes over 4 feet high - Building codes will vary. Check your local codes. In my case, the wall I needed is about 75 feet long and from 3 to 4 feet high. 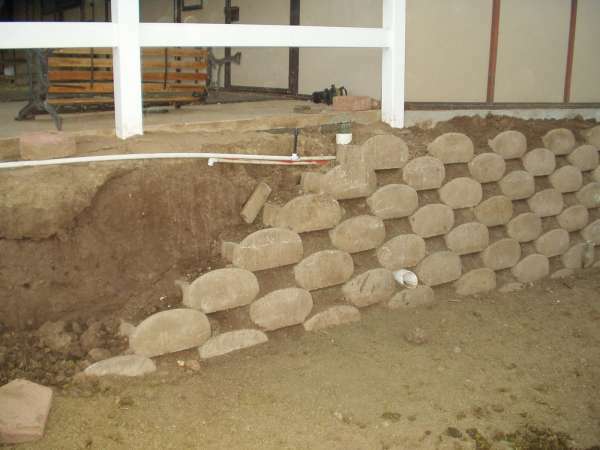 The estimate received for the traditional concrete block wall was $6,500. The cost of matierals for the Verdura 30 blocks was $1,200. However, the cost of the manual labor I have endured to dig, stack and backfill this wall is, well, I don't really want to think about it. Make no mistake about it, this is hard work. Each of the block weighs 62lbs. But if you are up to the task and want to save some serious money on a project like this, the stacking blocks are a great option. My understanding is the the particular block manufacturer I used (soilretention.com) only sells their products in California as they have not established resellers nation wide yet, so check with your local masonary block supplier for products available in your area. Here is a picture of my project. You can see the beginning of the retaining block wall on the right. The white PVC pipe is for sprinklers. Getting a closer look... here you can see the first row buried. The beauty of these blocks is that you can do the work at your own pace. As you can see, I have a way to go from this point. Another view... here you can see how a rounded corner can be made... it was very easy. Progress... Here you can see the wall just over half done with some drainage pipe. And one last close up.